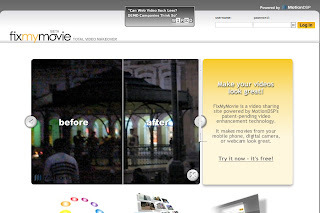 Fixmymovie is a video site, but it has a special service that helps people enhance their videos. As a video sharing site, Fixmymovie offers free register, after that, you can upload your video to its server, it will use enhance technology to fix and improve your video which took from cellphone, digital camera, or webcam. You can view and compare to different pictures on one window. If you like you can share your video with other people or embed video onto your site. I did not use it but I browsed some videos its gallery, I do not think it make big difference between original and enhanced one.